town. They had formerly volunteered at the Beaches Museum but decided to follow Taryn Rodriguez-Boette, Associate Director and Archivist, when she started working at the society. Mary Anne describes herself as a “Jacksonville native who was born in Savannah.” Her mother was a Georgia native and went home to have her babies, but returned to Jacksonville to raise them. Mary Anne attended Venetia School, St. Paul’s Riverside, St. Matthew’s grade school, and Bishop Kenny High School. She has lived on both sides of the river–Venetia and Empire Point. She finally made the move to the beach in 1980, where she worked as a dental hygienist for many years. Mary Anne likes the archives, but loves the artifacts. She is the point person when setting up an exhibit! Linda Householder lived as a child in St. Augustine. Her father was a professional baseball player and since he traveled a lot, the family moved to St. Augustine where her grandparents, aunts and uncles resided. Her family, the Godwin’s, lived in Dupont Center, St. Augustine (property from a Spanish Land Grant given to an old St. Augustine family, Cornelius D. and Lenora Carter DuPont) for many years. When Linda’s father quit the baseball league, they moved “up north” and, she moved many more times with her husband Bill who was in the Navy. A few years ago they returned “home” to St. Johns County and since then Linda has become active in the community and in researching history. 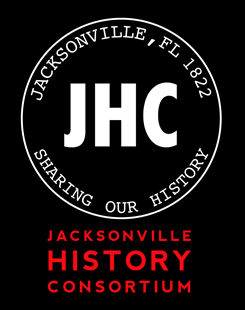 Come and visit the Tuesday ladies and learn more about the Jacksonville Historical Society and how we preserve history every day!